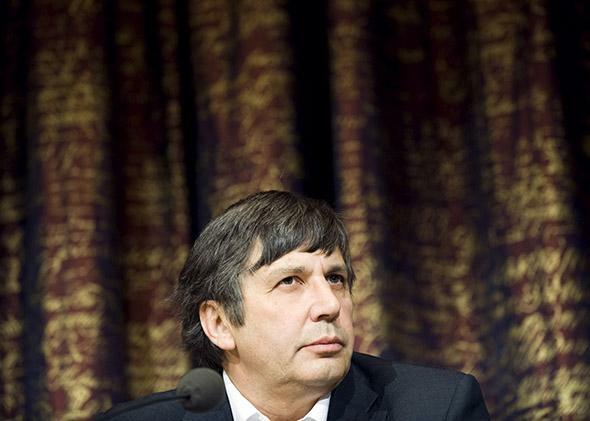 Nobel Prize in physics: Andre Geim went from levitating frogs to science’s highest honor. How outlandish experimentation and “grazing shallow” led to a Nobel Prize win. Andre Geim’s work on graphene came out of an unfunded side experiment. The following is adapted from Lewis’ The Rise: Creativity, the Gift of Failure, and the Search for Mastery, published by Simon & Schuster. “It says, ‘No entrance,’ but you just enter,” physicist Andre Geim told me about the graphite mines in the mountains where he often hikes. His comment embodied the insouciance behind his Nobel Prize–winning physics experiment and his habit of experimenting deliberately outside of his area of expertise. Geim, a Russian-born Dutch and British citizen and a professor at the University of Manchester, and his colleague Konstantin Novoselov won the 2010 Nobel Prize in physics for their experiments involving the single-atom-thick material called graphene—the thinnest, strongest, most conductive material in existence. It is predicted to replace silicon and transform the electronics industry as we know it. Geim won the Ig Nobel in Physics in 2000 for levitating a live frog with magnets. “In my experience, if people don’t have a sense of humor, they are usually not very good scientists either,” he said. The image of the flying frog first made the rounds after its publication in the April 1997 issue of Physics World, though many assumed it was an April Fools’ Day prank. Most thought that water’s magnetism, billions of times weaker than iron, was not strong enough to counter gravity; the demonstration showed its true force. Geim became curious about magnetism when he didn’t have the equipment to continue his experiments while working at Radboud University Nijmegen’s High Field Magnet Laboratory in the Netherlands. So one Friday evening he set the electromagnet to maximum power, then poured water straight into the expensive machine. He still can’t remember why he “behaved so unprofessionally,’” but he was able to see how descending water “got stuck” within the vertical bore. Balls of water started floating. They were levitating. He had discovered that a seemingly “feeble magnetic response of water” could act against Earth’s gravitational force. 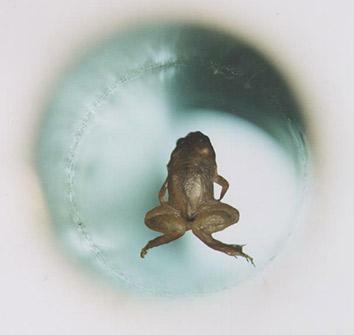 A live frog levitates inside the vertical bore of a Bitter solenoid in a magnetic field at the Nijmegen High Field Magnet Laboratory. When Geim tells this story, he’s not making a self-deprecating aside about a humble detour. He’s talking about part of the direct route he and his colleagues took to isolate graphene itself. What seemed like a late-night lark evolved into what Geim calls the “Friday Night Experiments.” On these occasions, Geim’s lab works on the “crazy things that probably won’t pan out at all, but if they do, it would be really surprising.” From the start of Geim’s career, he has devoted 10 percent of his lab time to this kind of research. The Friday Night Experiments (FNEs) are often so outlandish that they try to limit how long someone works on them—usually just a few months, so as not to hurt the careers of the lab’s postdoctoral fellows, undergraduates, or graduate students. Geim’s perspective is that it’s “better to be wrong than be boring.” But this means that the FNEs are, unsurprisingly, unfunded—due to their nature, they have to be. They are times when “we’re entering into someone else’s territory, to be frank, and questioning things people who work in that area never bother to ask,” Geim said. In other words, these are ways for Geim and his team to acquire the advantage of the nonexpert—the deliberate amateur. Out of the two dozen or so attempted Friday Night Experiments, three have been hits, a success rate of 12.5 percent. The flying frog was the first. The second was the creation of “gecko tape,” an adhesive that mimics the clinging ability of the gecko’s hairy feet. The third FNE hit was the Nobel Prize–winning isolation of graphene. “The biggest adventure is to move into an area in which you are not an expert,” Geim said. “Sometimes I joke that I am not interested in doing re-search, only search.” His overall career philosophy is to “graze shallow”: Do work in a new field for a few years and then get out. Geim and Novoselov found graphene hiding out in the graphite from an ordinary pencil. They isolated it with a tool that seemed even more rudimentary—a piece of Scotch tape. The physicists had never worked with carbon before. Their team worked long hours to familiarize themselves with the literature, although they were careful not to read so much as to read themselves right out of their own ideas. The graphene FNE began when Geim asked Da Jiang, a doctoral student from China, to polish a piece of graphite an inch across and a few millimeters thick down to 10 microns using a specialized machine. Partly due to a language barrier, Jiang polished the graphite down to dust, but not the ultimate thinness Geim wanted. The team submitted a paper summarizing their findings to Nature. The journal rejected it twice—which is such a common fate for historically path-breaking ideas that it could signal an unintended compliment. One referee said it did “not constitute a sufficient scientific advance,” Geim later said in his Nobel Prize acceptance speech. The wisdom of the deliberate amateur is an old idea for artists, seen in the freedom that comes in a late style or in the Zen concept of “beginner’s mind.” “Experience … is what gets you through the door. But experience also closes the door,” choreographer Twyla Tharp once said. “You tend to rely on that memory and stick with what has worked before. You don’t try anything anew.” Without off-road exploration, we have little way of figuring it out. The amateur’s “useful wonder” is what the expert may not realize she has left behind. It helps us get around what psychologists call the Einstellung effect, or the cost of success: the bias that creeps in without our notice and can block us from seeing how to do things in different ways. The term amateur is now pejorative: to be a dabbler, fancier, or hobbyist—all conceptual flirts. Yet centuries ago, the word amateur wasn’t meant to disparage. It described a person undertaking an activity for sheer pleasure, not solely pursuing a goal for the sake of their profession. The French amateur is from the Latin amator—a lover, a devotee, a person who adores a particular endeavor. “I suppose,” he continued, that is where “play comes in.” Playfulness lets us withstand enormous uncertainty: The deliberate amateur knows no other way. When a musician says that someone can play, it means they are skilled, responsive, and nimble; the person knows how to harmonize or offer dissonance when it’s right. Yet outside of the creative process, play is a term that can hurt the concept it names. A constellation of voices has begun to argue for the importance of permitting an adventurous approach into the process of innovative, serious work. NASA’s Jet Propulsion Lab (JPL), for example, considers play so critical for its engineers’ performance that it asks applicants about their hobbies as children. Google caused waves when it was perceived to be pulling back on its famous “20 percent projects,” its tradition of allowing employees to spend one-fifth of their time on their own experiments. Trammeled walkways that emerge on the grass and ground are called “desire lines”; in the woods and in cities, these footpaths often offer more efficient ways to get around than what urban planners have designed with paved streets. In Finland, urban planners often head to parks after snowfall to view how pedestrians would navigate if they followed their own desire. This is the kind of adventurous search that Geim exemplifies, seeking out roads that, though hidden, are found on open ground.